Join us for our Thursday Prayer Meeting tonight at 7:30 PM at National Louis U (850 Warrenville Rd. Lisle, IL). It will take place in room 225 on the second floor. We will spend time praying for ourselves, for our church (especially Restore Missions Weekend), and the world. We’ve been announcing it for weeks and now it’s finally here! 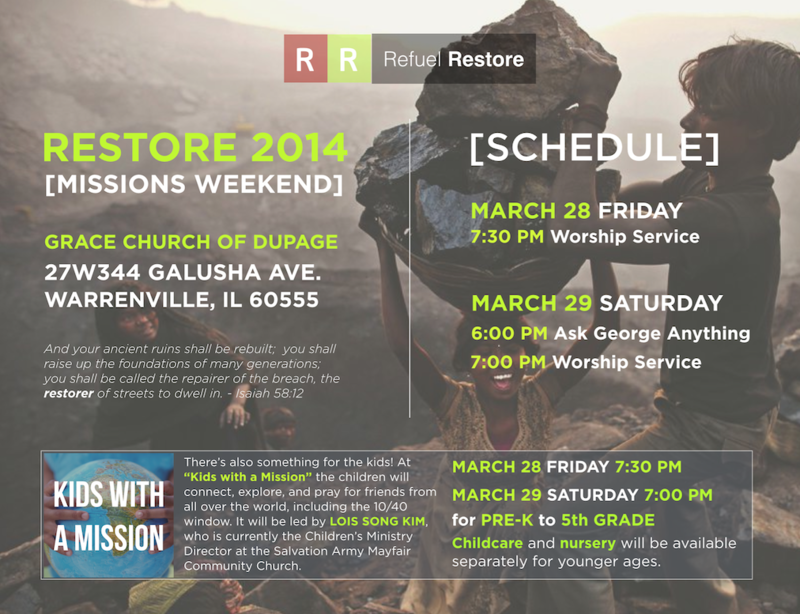 Please join us for Restore Missions Weekend, a collaborative event with a few other churches, as we desire to become more mission-minded. Our guest speaker is George Verwer, founder of Operation Mobilisation, whom John Piper considers as one of his leaders. We are thankful to have him share God’s Word with us. There will be childcare during both nights of worship (but not during the Q and A). If you are interested in getting baptized or confirmed during Easter service, please email us at asktrc@theredemptionchurch.com. There will be one class you will have to attend before Easter.